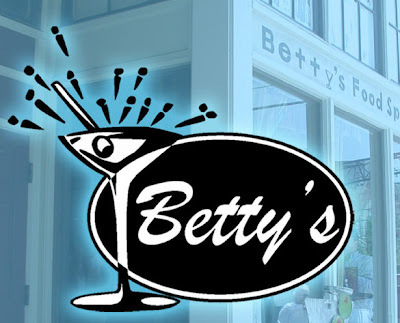 I'm sure I wouldn't be the first (or the second or the third or the fourth) to note that Betty's Food and Spirits in the Short North has good vegetarian food. But they do. So I did. There are plenty of pics out there...so I didn't take a camera with me. Actually, I wasn't planning on eating, so I didn't take my camera with me. But details, details. Aside from that, the vegan pan seared shitake, portabella and button mushroom wrap served over Asian slaw served over mixed greens and a Pale Ale Asian sauce drizzle was quite good. This was one of many vegetarian options on the menu, which also offered black bean hummus, quesadillas, fried plantains, cheese ravioli in pesto and vegetables, Asian stir fry, mac & cheese, veggie burrito, falafel sandwich and various other vegetarian delights. There is also a nice (albeit small) bar with a good selection of beer, wine and drinks that serves as the centerpiece of the establishment. The neighborhood has many other bars and restaurants that are fun if you manage to avoid the flock of yuppies and other dregs that gallery hop through the area. I didn't, so I recommend doing so. It's a good place. They provide good times. Don't go on a weekend and it should be a little more low key.